RV gets Ishaani on wall. She turns her face, crying. He puts ice in the glass of water, and gives it to her. He says he knows she feels really hot, that is why she was putting her clothes down. He is going to check the AC, then says what will happen of her in one glass. He hands a full jug to her. She pushes it away, and says she won’t drink water from him even if she is dying. He says she surrendered herself to him, and now doesn’t want to drink water from him. He says his baba is right, no one can understand wives. She asks him not to call wife. He says she is his wife, but he will call him Ishaani. She forbids him to take her name, he asks shall he call Billi, and teases her for being a wild cat. He goes to change, as eh knows he gets flu real quick. She drapes a dupatta around herself, goes to the vase bottle and drinks from it. In the house, Baa says it is so hot and asks Disha to bring the AC’s temperature down. She asks to tell her mother she has arranged for an extra bed for her. Pratik and Darwesh come and tell her that they will live with Sharman in a bedroom. RV comes and tells Ishaani that there is bath-robe in the bathroom, She might wear it. She denies, he says a wild-cat will look awkward in bathrobe. She opens the wardrobe and finds a nighty in it. RV comes to her back, and says this is honeymoon suite, here people come to celebrate wedding night. 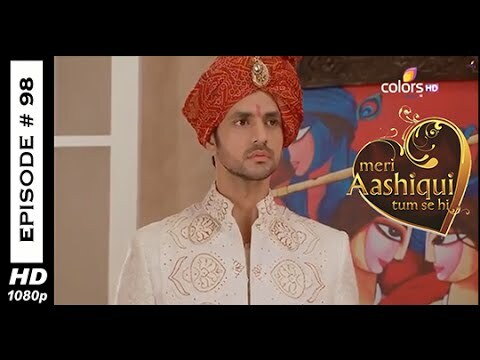 Ishaani says this belongs to the girl he was about to marry. RV says it is destiny, which wanted them both to get married. Ishaani puts it inside and says she won’t wear it. RV asks what is she disliking, that they weren’t for her, or were they for someone else. He says he won’t mind of she wears them, but she might get flu, cold and even pneumonia. He sits on the bed, with TV open. Ishaani goes into the bathroom, and see the bathrobe. Chaitali brings Baa, milk with Kaisar. Baa thanks her, that she started doing her old habits. Chaitali tells them that she started AC in her room as well. Amba watches this, Lakshmi says this is the right time to show them their place as RV and her husband both are out. Amba comes inside, and shuts the AC off. Baa asks what is she doing. Amba says this is her house. Now, she and all of them must get out. Baa says has she forgotten her son brought them here. Amba drags Baa. Lakshmi stops them all inside, while Amba drags Baa to the stairs. Parul watches this from a side. Amba takes Baa, she gets rid of her hand and asks where is she taking her. Amba says she is taking her to her real place and brings her to servant quarter. She says she will live here, now. Ishaani comes draped in bath-robe. RV watches her, while she hides behind the sofa. He looks away. She comes out, and she looks at her legs. She asks why is he staring at her. He says he is imagining, it seems the cat fell into the milk bowl, and smiles. She sits on the sofa, covering herself. She says firstly she has an head ache, now she is feeling dizzy. Everyone comes to the quarter. Amba tells her that her family will also live here. She says this is a place for humans, she also lived here. Cold breeze come from window, they must consider the store as their own room. Her son thinks with her heart, but she never takes the dust to her head. Baa told her that she deserved to live here, but today Amba says she doesn’t deserve to stay here even. Amba tells them, they will have to work like servants for her. She warns them of changing her decision, otherwise and leaves. All the family is worried to know about it. Lakshmi appreciates Amba, Amba says she just showed them their place. She wants to show all the fear and pain, she used to feel years ago. Ishaani sleeps on the couch, while RV on bed. He notices she was about to fell off the bed and brings the quilt for her, then makes her up on the couch. She turns, her face visible. He looks at her and smiles. He says she didn’t say anything to her, though he tried not to love her. But he couldn’t help loving her, he caresses her hair. She hits him with a fist, he fells down. She says he hit her, she will kill him now. PRECAP: Ishaani poses to be a cat for RV, he fears her and asks her to sleep. Ishaani wakes up, and says to RV that she will hit her. He was worried, is she alright. She was in a different state, and said she will kill him sunk in water he poured on her. He calls her name. She was posing to be a cat. He said he is her husband. She said he is Shaitan, and she is the naani. He corrects her as Ishaani. She says he is chai ki patti. He reminds she drink tea in morning. She says at night, she only drinks blood. He called her cat, now she won’t leave him. RV ran in front of her, while she gets him when he was about to fell down. She fells on his chest, winds her hands on the back and fells asleep. RV hugs her in return. He helps her to lie on the bed, and caresses her forehead. He puts the quilt on her. He says he promise that he won’t let her past ruin her, not even CHiraag. Baa and everyone was in much pain, as they prepared for beds. Baa says this is their house. Falguni says they will leave here, in the morning. Baa says that now Amba must leave the house. Payul brings food for them. Darwesh invites her inside, saying they were playing Antakshari. She apologizes, that since they hadn’t eaten anything se she brought food. They were all hungry and heads to eat. Amba comes there, and asks Parul if she brought the stale food. Parul stammers, but Lakshmi says she told them to give them stale food. Amba says to Lakshmi that she doesn’t know about the rules, but they all know about the rules of the house. She asks how dare they even see the fresh food, but since today is her son’s wedding, they must eat it. From tomorrow, they will have to earn this food. They won’t get safe. Falguni says they will do what she will say, but requests her to leave. Amba tells Lakshmi to make them sleep early, as the servants wake up before the masters here. Lakshmi appreciates Amba, and says she must have took class of Falguni as well. Amba laughs, and says she is angry at most. Hansa won’t like it, if she makes up with Falguni. Chaitali comes to Amba, and says she gave her a lot, she will do all her house hold and asks for a separate room. Amba tells Lakshmi to give a room without AC. RV was wearing shoes, when Ishaani wakes up. She sits on the bed, them thinks how she came here on the bed. He says he will show her. She forbids him to come near. She asks he only thinks about it, only. He saw she was asleep, couldn’t do anything. She feels the head ache, watches a bottle she drank from. He thinks it was the juice Chaitali had given him, and smiles. Amba comes to wake them next morning, and says here the servants have to work from 7 o clock. Baa says RV brought them here, she will complain that she will tell him what his maa is doing to his mota bapu’s maa. Amba laughs, that will he scold her. She is his mother, he gave them place to live, not her place. She will complain RV, such that he will throw them on the road. RV bought their office, to take revenge. They must think what he will do to them. She instructs everyone about the household work, and says to Baa to come to her room, as she will only do her work. Ishaani says he mixed something in the juice, so that she got unconscious. He says he doesn’t need to mix anything in it, to do anything to her. He sits by her side, and says he enjoyed what ever happened. Ishaani asks what happened. RV says no one tells about such things. Ishaani sees marks on RV’s neck. PRECAP: Amba asks what happened on RV’s hand or neck. He says a wild cat came to their room.